Helen Anders - 97 of Stronghurst. Helen was born in Chicago, the daughter of Herman and Amanda Karloske, German immigrants. Her father came to New York at the age of 7 and he met her mother on Long Island, New York. Her father rode freight cars looking for work and he and his wife settled in Chicago. Helen was the 3rd child of four. Her father was a electrotyper for "Globe Engraving" doing work for newspapers and magazines. Her mother was a homemaker. Growing up, Helen's family read books, played tennis, enjoyed picnics at the large parks around the city and her parents enjoyed going to friends houses singing and playing musical instruments. Her father played the guitar and the mandolin. She remembers her father's firm teachings: "We were to be good American citizens. We weren't to speak German. We were to be the best citizens we could be. He wanted us to vote, not change jobs too often, not move too often, pay all our bills promptly, and we were not to dance or play cards. And, were to leave any went to work at Equitable Life Insurance Co. in Chicago. After several years she worked for another company where she met her future husband, Roy Anders, a Media-Wever graduate and Ft. Madison, Iowa Business College graduate. Several from this area came to Chicago for jobs. In 1930 Helen married Roy and lived in Chicago. Helen changed jobs working at the YWCA downtown. She had to hide her wedding ring before going to work because married women were not allowed to work. In Chicago their three children were born. At that time, she said there were no electric street lights, no sidewalks but dirt streets. They had gas and running water and electricity in their home but no refrigerator. "We had an ice box and would put a big 50 or big 100 in the window on ice day and leave our doors unlocked and the ice man would come in and put a big block of ice in our icebox," she said. It was hot in the summers and our children slept on a screened in porch. Their home had been broken into twice by coming in through the basement and they walked out through the porch and they had taken Roy's brand new suit that he had never worn that was hanging there. In 1943, Roy joined the Navy in the Pacific during WW II and was on a supply ship. He kept the log on the ship. That September, Helen took their three children and moved in with his parents on a farm near Stronghurst, Arthur and Orva Anders. It was safe here. In Chicago there were Nazi meetings above the bakery next door to their home. Helen's mother had died of heart problems when Helen was 17. Her dad contracted Tuberculosis (TB) from poor conditions at work and his Union paid for his treatment in Colorado where he stayed until he was finally cured and came back to Chicago. He died later of failing health. 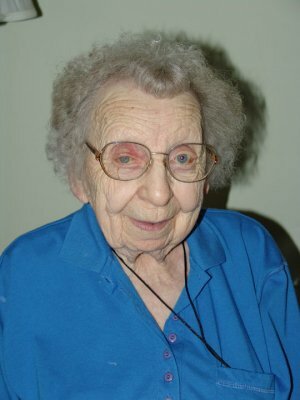 Helen worked in Stronghurst for 9 months at the Extension Office. The rest of the time she kept busy at home, with their children and church and supporting Roy however she could. Roy farmed, was a Deputy Sheriff, Henderson County Treasurer, on Boards for the American Cancer Society, Health Dept., OakLane Nursing, WIRC and was a Republican Precinct Committeeman. Helen and Roy volunteered for 13 years at the Burlington Hospital Medical Center. She was active in the Presbyterian Church after Mrs. Guy Sanderson started taking the children to Sunday School, "and we followed." Roy was Clerk of the Session and Helen was active in mission groups. After 71 years of marriage, Helen lost her mate in March of 2001. Helen has family and friends who watch after her and she appreciates visits. Helen has trouble seeing but attends church on Sunday thanks to Richard and Marlene Knutstrom. "I couldn't go if it weren't for them. At church people are friendly. It means a lot when you are alone when people come up to you and speak." Helen said the TV was a marvelous thing but not the quality it was years ago, "sometimes TV is just awful!" Helen's children are: Robert (Marilyn) of Zionsville, Indiana; Jean (Ronald) Melvin of Aledo; and Doris (James) Cook of Raritan. She also has 10 grandchildren, 20 great grandchildren and 2 great great grandchildren subject to change at any minute.